Dealmoon Exclusive! 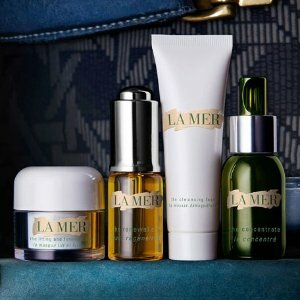 Bergdorf Goodman offers 11% off with La Mer purchase via coupon code BGMOON . No tax except for shipping to NY/NJ/PA/TX. Free Shipping & free Returns . Disclaimer: Offer is online only for a limited time. To receive 11% off, enter the promo code BGMOON in the promotion code box in your shopping bag during checkout. The value of your order must total $0.01 before shipping and tax. Discount applies to merchandise total only. Does not apply to previous purchases or wedding registry items. Not valid with any other discount offer, the BG Gift Card purchase, or in store. Offer excludes: Amore Pacific, Balenciaga, Berluti, Brunello Cucinelli, Canada Goose, Celine, Chanel, Charvet, Christian Louboutin, Christian Dior, Dries van Noten, Dyson, Hermes, Gucci, Ktih, Loro Piana, Miu Miu, Prada, Prada Linea Rossa, Rimowa North America, Sulwhasoo, Valentino, Van Cleef & Arples.Limited time offer. La Mer Creme de, 2 oz. La Mer The Concentrate, 1.0 oz. La Mer The Treatment Lotion, 5 oz. La Mer The Intensive Revitalizing Mask, 2.5 oz. La Mer The Brilliance Brightening Essence, 1 oz. La Mer Lifting Eye Serum, 0.5 oz. La Mer The Cleansing Foam, 4.2 oz. La Mer The Eye Balm Intense, 0.5 oz. La Mer The Regenerating Serum, 1.0 oz. La Mer The Concentrate, 1.7 oz.